By Scott DiSavino Dec 20 (Reuters) – U.S. liquefied natural gas (LNG) export capacity is on the brink of doubling in 2019, which will boost the super-cooled fuel’s influence on the U.S. natural gas market, where volatility surged in 2018 after several years of slumber. LNG exports have been the fastest growing source of U.S. natural gas demand since the country started ramping up exports in 2016, and is expected to expand deliveries in coming years as several more export terminals enter service. Its imprint is being felt in the U.S. gas futures market, which in November experienced its longest stretch of extreme volatility in nine years due to demand, low inventories and unseasonably cold U.S. weather. LNG currently accounts for just a small amount of overall domestic gas demand. But as the country opens more facilities for export to meet growing needs abroad, analysts said more ups and downs in prices are expected. “As LNG exports increase, so will future gas prices,” said Tom DiCapua, managing director of wholesale energy services at Con Edison Energy, a provider of energy management services, including the purchase of gas, for power plants owned by several companies. Prices at the U.S. Henry Hub benchmark in Louisiana hit $4.929 per million British thermal units (mmBtu) in November – their highest in four-and-a-half years. That was also well above the five-year average from 2013-17 of $3.25/mmBtu. The United States is on track to export about a trillion cubic feet of LNG by year-end, or about 3 percent of overall U.S. gas demand in 2018. But LNG exports are expected to rise to 5 percent of overall U.S. gas demand in 2019 and to 10 percent in 2024, according to the U.S. Energy Information Administration (EIA), boosting LNG’s potential to affect prices. “LNG exports will be one of the most bullish demand factors for U.S. natural gas prices over the coming two years, when several terminals are set to come online,” Raymond James analyst Muhammed Ghulam said. There are three LNG export terminals presently in operation in the United States. Those include Corpus Christi in Texas, which shipped its first cargo in December. Three more terminals are expected to enter service in 2019, boosting U.S. LNG export capacity to 8.9 billion cubic feet per day (bcfd) of gas, making it third largest in the world behind Australia and Qatar. U.S. production is expected to rise 11 percent to a record 83.3 bcfd in 2018, the biggest year-over-year increase since 1951, according to EIA projections. One billion cubic feet is enough gas to fuel about 5 million U.S. homes for a day. Investment decisions are imminent on another three U.S. Gulf Coast projects worth an estimated $20 billion, in 2019, while several other facilities are in the planning stages in the Pacific Northwest. 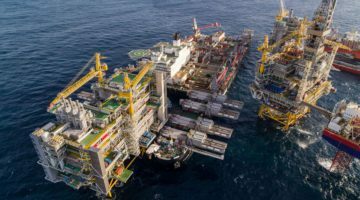 “The first half of 2019 will be an especially busy one for the U.S.,” said Alex Munton, Americas LNG analyst at energy consultant Wood Mackenzie. Some consumers say there may not be enough gas production and pipeline capacity to support growing domestic markets in addition to LNG exports. “Pressure on U.S. gas prices at peak demand mounts with every additional LNG export,” said Paul Cicio, president of Industrial Energy Consumers of America, an industry lobby group. He said the United States should not approve new LNG export terminals until the government determines the country can first meet domestic demand. Houston-based Cheniere Energy Inc, the biggest U.S. buyer of natural gas, said its LNG exports are not causing market volatility.